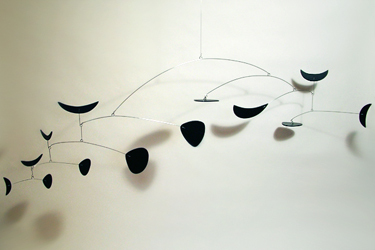 This mobile has been on the net from many articles, it is a Popular Science design by Rolly Crump 1954. He made set designs for Walt Disney. Read article: http://frithmobiles.blogspot.com /2010/03/rolly-crump-earliest-mobile-maker-and.html. I re-designed this mobile from the public domain original Rolly Crump design, but with my 'Frith' infuence and design added. A beautiful collectible mobile, with a definite history behind it. This mobile was also used in the Jerry Lewis movie "Max Rose", but sadly never came out. Video: Rolly Abstract Mobile in Motion!